Larry Hagman, Patrick Duffy and Linda Gray return to Southfork as JR, Bobby and Sue Ellen Ewing in TNT's all-new series Dallas, and they're bringing with them a whole new collection of secrets, schemes and betrayals. This time, they’re joined by the next generation of Ewings, who take ambition and deception to a new level. Jesse Metcalfe, Josh Henderson, Brenda Strong, Jordana Brewster and Julie Gonzalo also star. 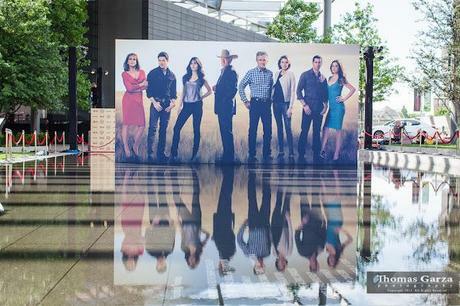 Shot on location in the title city, the ruthless rivalries and Texas-sized power struggles within the oil and cattle-rich Ewing dynasty are ready to heat up TNT's summer lineup in Dallas, which will air Wednesdays at 9 p.m. (ET/PT), beginning with two back-to-back episodes on June 13. "Yee Haw!" That’s how I felt when I heard that DALLAS was coming back to the air! The first run made the city WORLD FAMOUS! So, how will this generation compare? I headed out to the red carpet premiere to find out! First off, a HUGE shout out to TNT who REALLY made this an amazing red carpet event! EVERYONE was there! Even national TV like Extra! 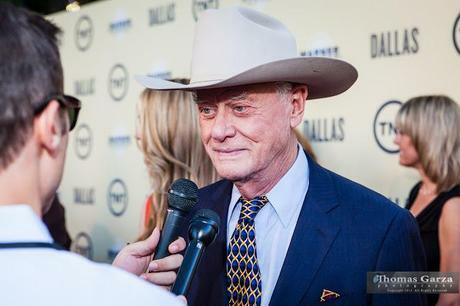 The one thing you kept hearing on the red carpet by everyone, including the producers, was “It’s called DALLAS for a reason! The show has as much to do with the city and it’s intrinsic view as it does with the scripts”. I wanted to find out just what the cast had been up to during their filming in Big D and what THEY liked about our fair city. Julie Gonzalo, who plays Rebecca Sutter (Christopher Ewing's fiancee) said, “I got to call Dallas my home for about 4 months and it was lovely. I loved the parks because I have a dog and I took him to every park I could find. “EVERYTHING!” is what Linda Gray blurted out when I asked about her favorite part of being back in Dallas, “We live here. We get to be infused by the city. I joined the Dallas Museum of Art. I love the arts district. I LOVE the people! Everything about this city is wonderful! Lunch at the Nasher is great. Everybody is still as lovely as ever!” Do I even need to tell you that Linda plays Sue Ellen Ewing? The long-suffering ex-wife of the dastardly J. R. Ewing. Hometown boy, Josh Henderson sweetly brought his mother to the premiere. “DALLAS really put the city in a positive light to the rest of the world. And to be from here and back and shooting in just an honor and a blessing.” He's out to make his mark as John Ross Ewing, JR's son. 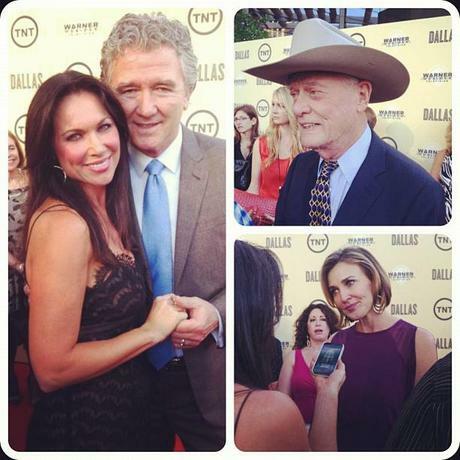 DALLAS the new series starts June 13th on TNT. This is a show no one should miss!! Special thanks to Thomas Garza for the amazing photos and to LeeAnne Locken for far-surpassing my expectations with her amazing red-carpet interviews!